A flexible, biodegradable optical fiber that can deliver light into the body for medical applications is the latest work of a collaboration between electrical engineers and biomaterials engineers in Penn State’s Materials Research Institute. The ability to deliver light into the body is important for laser surgery, drug activation, optical imaging, diagnosis of disease, and in optogenetics, the experimental field in which light is used to manipulate the function of neurons in the brain. Yet, delivering light into the body is difficult and typically requires the implantation of an optical fiber made of glass. Currently, people use glass fiber to get light into biological tissue at depth, but glass is brittle and is not biodegradable. It can break and damage tissue if implanted. Researchers are beginning to look toward flexible polymer fibers as a solution. Yang previously invented a polymer based on citrate, a naturally occurring key ingredient in metabolism, that he developed as a general platform for biomedical applications, such as biodegradable bone screws for bone fixation, scaffolds for tissue engineering and nanoparticles for delivering time-released therapeutic drugs. Now, he is collaborating with Zhiwen Liu, Penn State professor of electrical engineering, using Yang’s citrate-based polymer to create a step-index optical fiber for light delivery inside the body. A step-index fiber has a core material that transmits light and a cladding that protects the core and keeps the light from escaping. Yang’s lab makes and tests the polymer and then takes it to Liu’s lab to turn into a fiber. Once the fiber is tested and fine-tuned, Yang’s lab implants the fiber in biological tissue for testing. “The present work demonstrates the first citrate-based flexible biodegradable polymeric step-index fiber,” said Dingying Shan, a Ph.D. student in Yang’s group. Shan is co-first author on a recent paper in the journal Biomaterials, which describes their work. “The use of the citrate-based polymers enables ultrafine tuning of refractive index differences between the core and the cladding layers,” added co-first author Chenji Zhang, a recent Ph.D. graduate in Liu’s group. 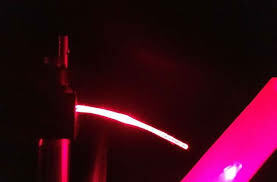 Because the core and cladding have identical mechanical characteristics, the optical fiber can bend and stretch without the layers pulling apart, as can happen with dissimilar materials. The two materials will also biodegrade at similar rates in the body, without harm. “We believe this new type of biodegradable, biocompatible and low-loss step-index optical fiber can facilitate organ-scale light delivery and collection,” Shan said. “And that it will become an enabling tool for diverse biomedical applications where light delivery, imaging or sensing are desired,” Shan said. “This new type of fiber creates a transparent window for peeking into a turbid tissue, and can enable new opportunities for imaging,” Liu said. As a preliminary step, the team first measured light propagation characteristics of the fiber and then used this information to demonstrate image transmission through the fiber.